George’s interdisciplinary practice skirts the peripheries of art, poetry, design and craft; a playful apparatus to explore the basic poetic urge of placing one thing next to another, in fertile proximity. A diverse practice is unified by a persistent atmosphere of humour and melancholy. Chinnery’s intuitive vocabulary is defined by its constant flirtation with obscurity, detail and a sensitivity to language and gesture. George graduated from Fine Art at Falmouth University in 2013, returning to the Midlands to continue an evolving arts practice. Recent exhibitions include group shows at Limbo, Margate, NN Contemporary, Northampton and Modern Painters New Decorators, Loughborough. ‘Remains of the Paper Mill’ is a digitally fabricated artefact. It functions as a fictionalised remnant of an apparently unpublicised and unattended occurrence in a snowy field, in Leicestershire. 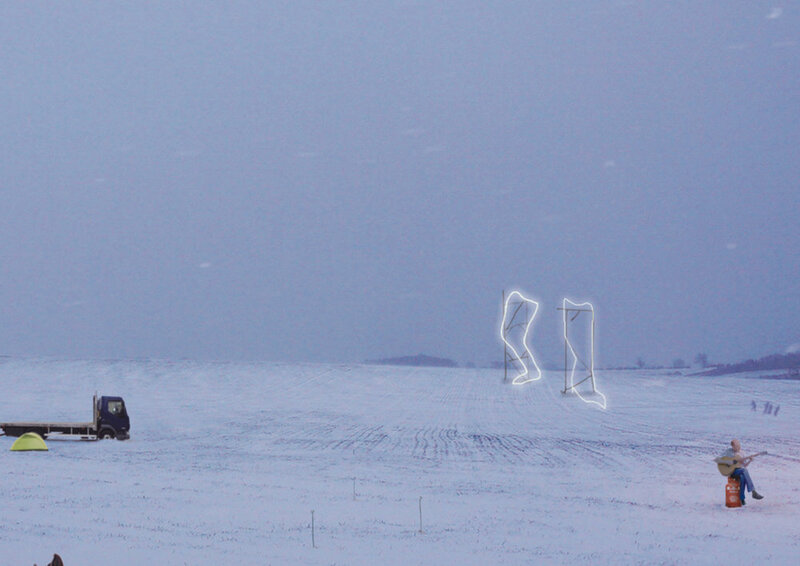 This expansive and cinematic photoshop composition is an experimental space in which the artist flirts with, as yet unrealised sculptural and durational happenings. Consisting of multiple, dispersed actions, it fluctuates between failed Historical re-enactment, intolerably repetitious performance and a ritualistic procession of banality. 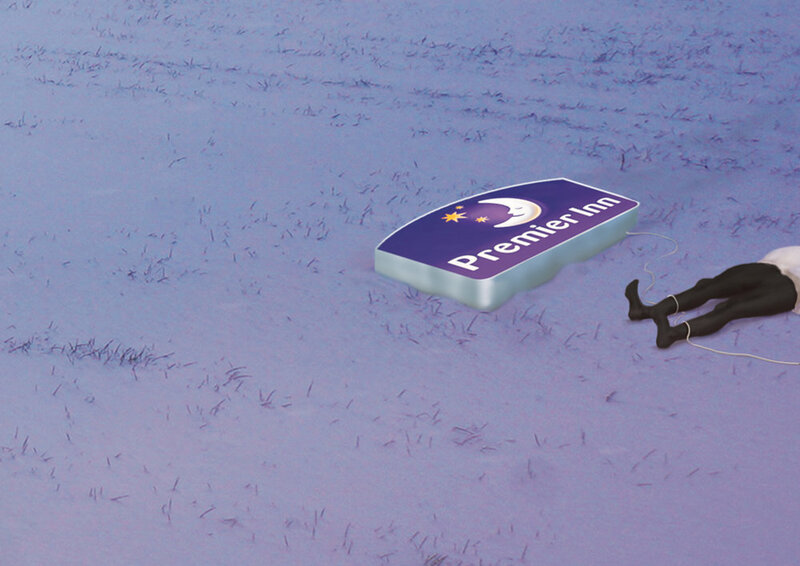 We see a melancholic horse trudging an endless circle, carrying an awkwardly slung figure, whilst another lays exhausted next to an illuminated Premier Inn sign. 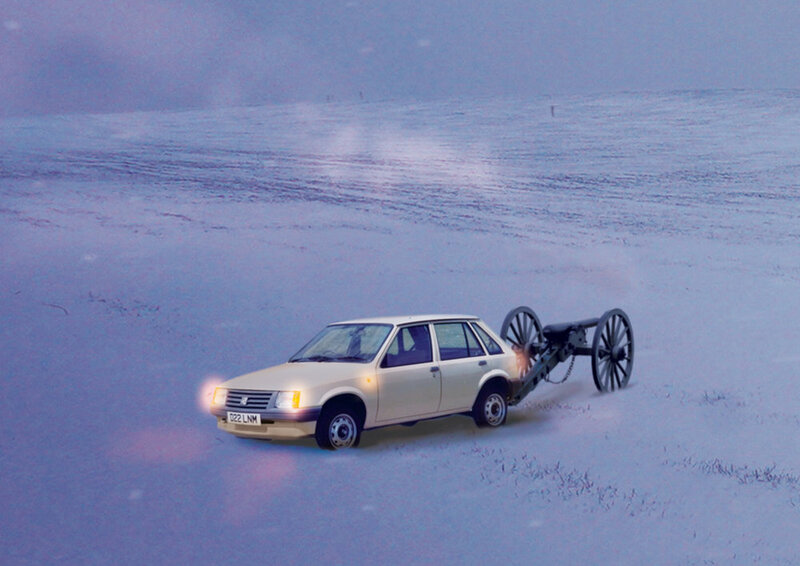 An aged hatchback appears to tow a recently fired field cannon. In the distance a Freelance Arts Administrator strums a guitar atop an empty gas canister. The indeterminate performance represents an imagined culmination of recurring themes and frustrated artistic identities, whilst manifesting the artists obsession with incoherent, anti climactical and circular narratives.